This gel pad is designed for use with recliner chairs to prevent and heal stage 1-2 pressure sores. The gel cushion is made of medical grade pressure reduction foam & gel combined together. The foam prevents the cushion from bottoming out and the gel combined provides great pressure redistribution for patient comfort. 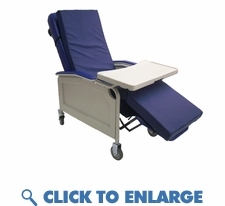 This is a great addition for patients trying prevent or heal bed sores that spend time in a recliner chair. Patients that use alternating pressure mattresses to sleep on at night use this for prevention therapy during the day. Easy to clean 1 pc gel recliner with a stretch cover that helps reduce skin shear.